Water slides are a dime a dozen on cruise ships, but the AquaDuck is the only water coaster on a cruise ship with the kind of drops and g-forces you would experience on a roller coaster. It is located on the top decks of the Disney Dream and Disney Fantasy, which are two sister ships in the Disney Cruise Line fleet. The 765-foot-long AquaDuck is elevated high above Deck 11 on tall stilts. The water coaster circles the ship in a transparent acrylic tube, with water jets propelling riders through uphill sections. The majority of the ride takes place in a clear tube, but a section of the ride is enclosed as it travels through the ship's forward funnel. Kids must be at least 42 inches tall to ride the AquaDuck. Kids who meet the height requirement but are not yet seven years old must ride with another rider who is at least 14 years old. Kids must be at least 54 inches tall to ride alone. After leaving the loading area, the raft zooms 12 feet out over the edge of the ship and 150 feet above the water. Because the AquaDuck's tube is clear, riders can see the ship's top deck and out over the ocean. The AquaDuck's gentle slope lets riders enjoy a leisurely trip around the ship. After boarding, the ride takes just over a minute to complete. 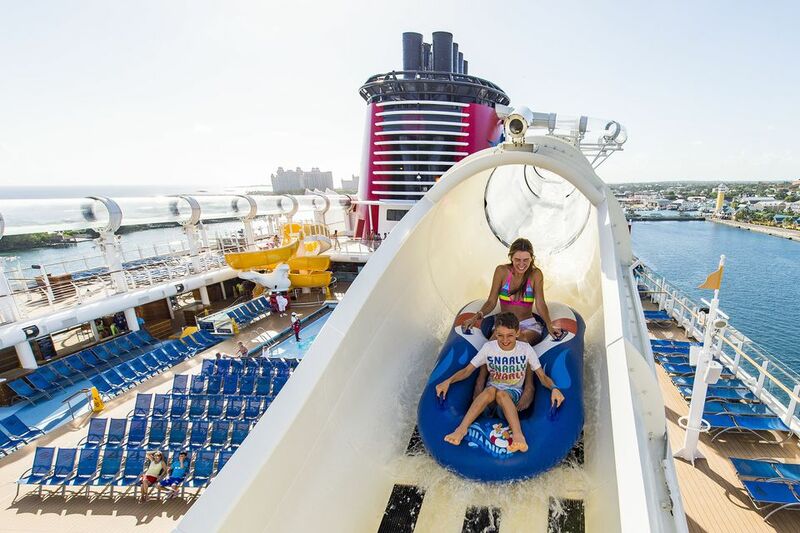 While on the AquaDuck, riders can survey the top deck of the Disney Dream, with its two family pools, yellow slide at the Mickey Pool, shaded water splash area for little ones, and Disney movies on the big screen. The AquaDuck uses about 10,000 gallons of water per minute. In the Edge, the tweens' lounge, several windows let kids catch a glimpse of AquaDuck riders as they zoom by. At night, the AquaDuck's lights are turned on for a colorful and different ride experience. At the end of the ride, the AquaDuck emerges from the tube and splashes down gently into a landing pool. You'll be nearly dry when you emerge from the raft. Have You Ridden Disney Cruise Line's Hairiest Water Slide?